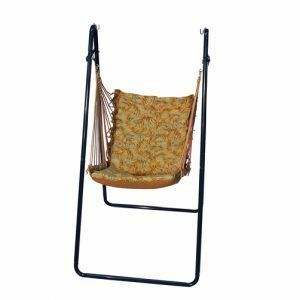 Algoma Comfort Hammock Swing Chair and Hammock Stand Algoma Hammocks Comfort with a splash of color to your patio or outdoor space with our Algoma Comfort Hammock Swing Chair and Stand! 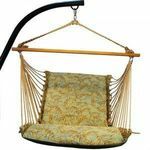 The Algoma Comfort Hammock Swing Chair and Hammock Stand is made of heavy duty macrame clewed ends on steel rings, 100% mildew resistant polyester rope cord, and extra thick foam filled cushions on both front and back. 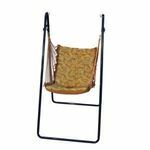 It comes with a powder coated smoke colored stand and extra wide seating. 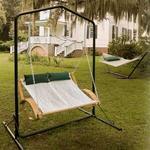 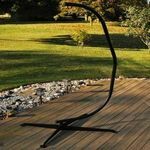 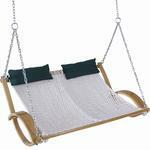 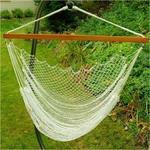 Algoma Comfort Hammock Swing Chair and Hammock Stand!